FFL President Serrin Foster’s latest op-ed, SB-320: Should Public Universities Offer Abortions Via the Pill? Feminists for Life Say “No.” has just been published on Naomi Wolf’s site, DailyClout. Requiring state college health centers to stock medication abortion is not the answer. Tangible support, including housing and child care, empowers women — especially poor and minority women — at a critical life juncture and allows them to make a true choice, not one driven by a lack of options. To read the rest, “Pregnant Students Deserve Resources and Support, Not a Bitter Pill,” click here. 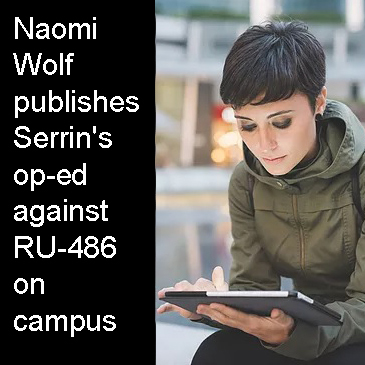 You can also read the study recently co-edited by Serrin and Kellan Monroe and published by FFL about the need for expanded resources on California state universities and college campuses here. A Rhodes Scholar and former adviser to the Clinton and Gore campaigns and author of eight New York Times nonfiction bestsellers, including The Beauty Myth, Promiscuities, and Misconceptions, Naomi Wolf has been creating globally valuable news and opinion content for digital media and for publishers for 28 years. Wolf’s site is read by one million millennials. DailyClout is a site designed to help “ordinary people to see real bills change in real time, to comment on them, and to raise their voices in public more effectively than just sending an email or signing a petition.” You can view SB-320 on BillCam, DailyClout‘s tool that lets you see, share, and affect live legislation, here.